← Hooray for Football Season! “Boardwalk Empire” is a new HBO series, which premieres this Sunday. I haven’t seen it, so I don’t know too much about it except that it’s based on a true story set in Atlantic City, once known as “The World’s Playground.” The buzz around “Boardwalk Empire” is, well, the best kind of buzz a new show could ever want. I have seen the promos and they have a sizzling energy that simply crackles. Excitement is in the air. Someone better warn Snooki and the whole lot of them at the “Jersey Shore” that the antidote to their idiocy has finally arrived. 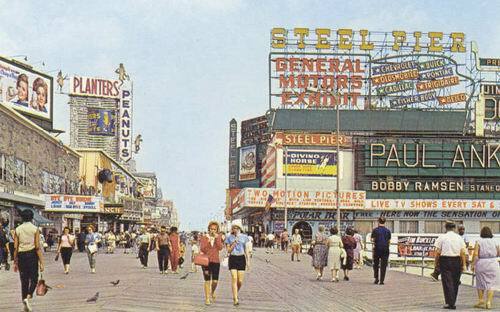 The Steel Pier, circa 1960's. Now, anyone who knows me knows how many shows I watch and that it’s suicide to take on yet another one. After all, watching a series takes dedication, especially with Tivo making sure I never miss an episode. It’s like signing a contract. I need to make sure I’m prepared to be in it for the long haul (assuming it’s not cancelled after one season.) Plus, watching a series on HBO means no commercials to fast forward through, so an hour show really is an hour. Now that’s a commitment! Still, I am planning to add this show to my repertoire and I’ve already programmed my Tivo for a season pass, thank you very much. For “Boardwalk Empire” doesn’t just bring the promise of a high quality, superbly written drama. “Boardwalk Empire” might as well also be the story of my life. At least, my growing up years. Sure, “Boardwalk Empire” is set in the Roaring Twenties and let me make it clear that I absolutely was not around then. But sometime during the fifties and sixties, my family could be found spending every summer there, on the boardwalk of Atlantic City. We’d wake up in the wee hours of the morning (my father liked to start out early to get ahead of the traffic) and groggily pack ourselves into the car, taking the Cross Island Parkway to the George Washington Bridge and over into New Jersey, then south on the Garden State Parkway. We’d arrive about 160 miles later. Who can forget the smells of our summer haven—sea air mingled with salt water taffy and Belgian waffles that wafted through the breezes on the boardwalk? Who can forget Mr. Peanut himself, standing tall with his monocle and a broad smile that greeted us beach goers as we strolled aimlessly, without a care in the world? I just loved Mr. Peanut and every year looked forward to seeing him tip his tall hat as if he was happy to see us return. And what about the Steel Pier, once called the “Showplace of the Nation”? This was the place for kids. My brothers and I, with a few coins in hand, would be left here to our own devices—to explore the sights and sounds, and to enjoy the rides. Most of all, to have fun. No troubles, just three kids having the time of our lives. Hours later we’d all reunite to see an outdoor show which featured a woman on a horse diving 60 feet into a 10-foot deep pool of water. Amazing. Back then we didn’t know how dangerous it was for the woman and the horse, nor were we aware of any animal cruelty. Back then, we were just in awe. Yes, nothing beat Atlantic City where walking along the Boardwalk was more fun than the beach itself. Taking in the scenery, the good times, and the feeling that we were kids in paradise and growing up was still a world away. I was 16 the last time we visited Atlantic City. It was our last vacation as a family. We wandered through the Boardwalk with nostalgia and sweet memories of those innocent days brimming in our hearts. But sadly, the Atlantic City of our childhood was now in decay, largely due to travelers preferring to fly to their vacation spots rather than stay close to home. This was just before 1976, when New Jersey voters would approve legalized gambling and Atlantic City would begin to experience a period of revitalization. The years have passed and I now live in California. I have not returned to see today’s Atlantic City and this has allowed me to keep my memories mostly intact. Atlantic City of my youth. Maybe it wasn’t quite its heyday, but close enough. And now I can’t wait to see how “Boardwalk Empire” captures it all.